Spring has definitely sprung this year. But today, the day started off a bit chillier than it has been for the last couple of weeks. This gave me opportunity to break out one of my favorites, Terre d’Hermes. I’m not much for “this is a winter” or “this is a summer” scent classifications, but in this case this fragrance best suits my fall and winter moods. On initial application, you get a rush or citrus and orange with a slight clove note (I don’t notice cloves as an ingredient, but to me it’s there). The orange then takes background to a beautiful and warm cedar scent. When you mention cedar, I typically think of hamster cages; but in this case, the hamster would be lounging on the most luxurious bedding imaginable. Terre d’Hermes is a unique scent that has great longevity and sillage. It’s a captivating scent without being intrusive. Although marketed to men, a female co-worker of mine was wearing this once and it worked perfectly for her as well. This is one of my favorites; so much so that I’m on my third bottle! Categories: Hermes | Tags: 5 bones, cedar, hermes, masculine, review, scented hound fragrance collection, Terre d'Hermes, woody | Permalink. This is my absolutely favorite masculine perfume. I haven’t tried wearing it myself but I love it on my vSO. It also comes in parfum concentration (still spray) but I tried comparing all three and failed to notice any difference. Just in case I keep buying EdP. I currently have the EDT version. I typically buy EDP, but asked for this for Xmas from by better half and specifically asked for EDP; but got the EDT (I don’t think he knew there was any kind of difference :)). As far as I’m concerned though, this wears the same as the EDP. My client Teri (whom you know) told me about your blog so this is my first time reading it. What a coincidence that the first fragrance you’re reviewing (terre de Hermes) happens to be my favorite scent!!! I have the parfum version and keep it reserved for only my most special occasions!!! I recently had to hide it because one of my friends likes to use it when he visits. Thanks for this review. I’m looking forward to reading more. I can see right from the start you have excellent taste!!! Thanks for reading BJ. Teri did say that she passed on my blog. Obviously she knows two people with excellent taste :). Its a great cologne!! Summer/spring and it’s on everyday! It’s an incredible cologne. One of my all time favorites…although for a bit more of a macho punch, I would also give Herme’s Bel Ami a try. A little more old school, and very powerful, I always get comments when I wear it. Right now, I’ve gone back to using the Armani Code. Everyone loves it! But at the same time everyones got it as well! I am so with you on the “Summer” “Winter” etc. bit. I just wear what I am in the mood for. Fashion has its seasons, fragrance is forever. 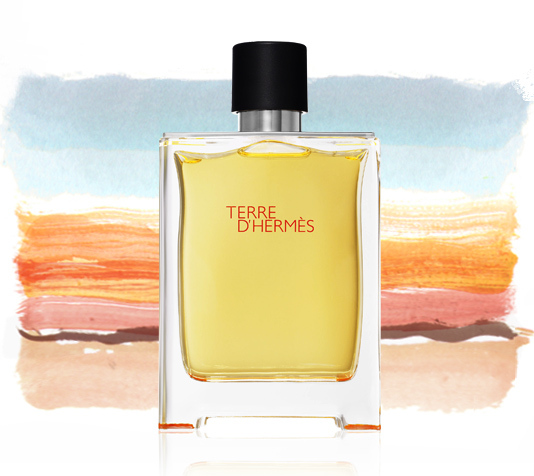 Now this one, Terre d’Hermes I have yet to try out but it sure gets good marks all around the web.